Different kinds of vehicles are seen gridlocked in the streets. In Asia and the Pacific, the rapid growth in the number of vehicles is the principal cause of traffic congestion although driver behavior and police enforcement are factors as well. Photo credit: Abir Abdullah/ADB. Half the world's 23 megacities are in Asia, and many of these have expanded far beyond their carrying capacity. The region is also home to over 6,000 cities with over 200,000 inhabitants, many of which also experience their own traffic management challenges. The region's vehicle fleets have expanded rapidly, too, in many cities more than doubling over the past decade. This has brought many once-dynamic urban areas to a virtual standstill. The "Avoid-Shift-Improve" model promotes alternative mobility solutions and sustainable transport systems in order to tackle gridlock and get cities moving again. How does the ASI model work? "Shift" entails moving toward environmentally friendly modes of transport, such as walking, cycling, or using public transport. "Improve" entails promoting efficient fuel and vehicle technology in transport, such as using clean fuels and clean technology. Where did the ASI model originate? The German Technical Corporation (GIZ) is credited for introducing the model in the 1990s. The model gained wide international acceptance as a guiding principle for sustainable transport after the Bellagio Declaration on Transportation and Climate Change in May 2009. What are the benefits of adopting the ASI model? The International Energy Agency estimates that the widespread adoption of the Avoid-Shift-Improve model will reduce spending on vehicles, fuels and infrastructure by as much as $70 trillion between now and 2050. These savings come from reduced spending on oil in the transport sector, as well as from reduced capital and operational expenses on vehicles and the world’s rapidly growing roadway infrastructure. According to Lloyd Wright, senior transport specialist at the Sustainable Development and Climate Change Department of the Asian Development Bank (ADB), the widespread adoption of the Avoid-Shift-Improve model and other sustainable transport policies could reduce spending on oil in Asia and the Pacific by more than 40% by 2050. However, simulations have shown the three components--avoid, shift, and improve--are not nearly as effective if implemented individually or in isolation. What countries have adopted the ASI model successfully? Tokyo, the capital of Japan and one of the world's biggest megacities, is known for having the most efficient railway systems in the world. In addition to efficiency, Tokyo's railway station areas have also emerged as models of transit-oriented development (TOD). They are home to many "rail-integrated communities" (RICs): high-density, safe, mixed-use, pedestrian-friendly developments around railway stations. Acting as community hubs, served by frequent, all-day, rail rapid transit and are accessed primarily on foot, by bicycle, or by public transit, these RICs turn riders into customers, and vice versa, at all times of day. Though they receive little financial support from the government, private railways in Japan achieve profitability by diversifying into real estate, retail, and numerous other businesses. This model has allowed Tokyo to achieve one of the highest rates of public transit usage and gave city dwellers the freedom to view automobile ownership as a lifestyle choice rather than a necessity. Shinjuku station in Tokyo, Japan is one of the busiest stations in the world in terms of passenger numbers, and is one of the successful models of transit-oriented development. Guangzhou, the third-largest city in the People's Republic of China (PRC) and one of the fastest-growing cities in the world, has gained global attention for its successful Bus Rapid Transit (BRT), unveiled in February 2010. The Guangzhou BRT (GZ-BRT), which is more than three times bigger than any BRT system in Asia, has set many world firsts. With 23 kilometers (km) of bus corridor, it carries around 1 million passengers a day, or 35,000 passengers per hour per direction, and riders are seamlessly connected to both the metro system and the city's new bike-share network. 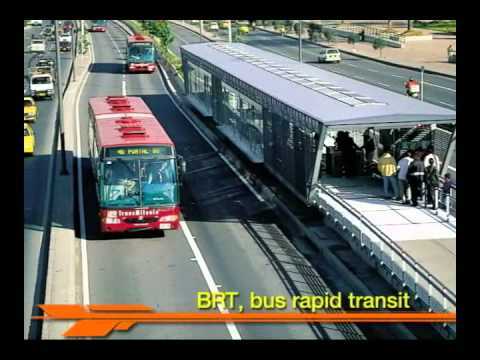 As such, it has the one of the world's highest BRT bus flows, with one bus every 10 seconds into the city in the morning rush hour; the first high-capacity BRT system worldwide to operate "direct service" routes, which means it has no terminals and no interchanges, and uses predominantly regular 12-meter buses. It is also the first BRT system worldwide with a bike sharing system planned and implemented at the same time along the corridor. 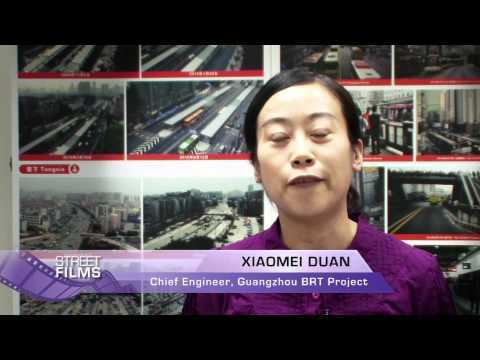 Guangzhou's Bus Rapid Transit system ensures mobility for the city's more than 8 million population. Guangzhou also possesses a renowned "greenway" network -- corridors exclusively for pedestrians and cyclists, which provide a safe and convenient way to get about the city. Since 2010, Guangzhou has constructed over 2,000 km of greenways, making the city a global leader in this new concept. 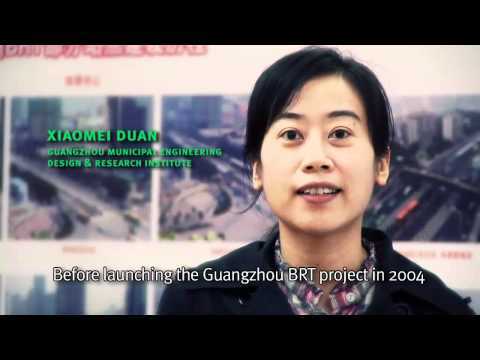 Find out why Guangzhou won the Institute for Transportation and Development Policy's 2011 Sustainable Transport Award because of its remarkable bus rapid transit system. Seoul, the capital of the Republic of Korea, made significant reforms in its transport policies to curb traffic congestion. In 2004, it reorganized its public bus services, introduced exclusive median bus lanes, shifted from private to quasi-public bus operation, and implemented an integrated transit-fare card (dubbed T-Money) system. Seoul also replaced its 6.4 km elevated highway that once covered the Cheonggyecheon River with a riverfront park, high-quality walkways, and public squares. Exclusive bus lanes were also constructed along 57 km of congested streets, and the city government initiated plans for additional bus lanes as part of a broader initiative to improve all aspects of the city's bus system. As a result, Seoul now boasts a public transportation system that is environmentally friendly and well suited to serve the needs of its citizens. Seoul a tore down a 6.4-km elevated highway to make way for a vibrant public space that features a riverfront park, high-quality walkways, and public squares. Paris adopted an Urban Mobility Plan in 1998 that included mass transit, parking and traffic management. The plan later added dedicated bus lanes; a pioneering bike-sharing program called Vélib', and an electric-car-sharing program called Autolib'. How can ADB assist countries in adopting the ASI model? Developing countries in Asia are expected to account for a significant chunk of the 57% increase in transport-related carbon dioxide emissions worldwide in the period 2005-2030, according to ADB. To prevent an urban crisis in the region's megacities, ADB has been leading the way in pushing for a fundamental change in Asia's urban transport policy and systems. The transport sector has been one of ADB's priority sectors over the last four decades, accounting for nearly 32% of total ADB lending. Since 1966, ADB has financed $35.6 billion in transport investments. In 2010, ADB approved the Sustainable Transport Initiative-Operational Plan that guides ADB investments in low-carbon, safe, accessible, and affordable transport systems and inclusive, clean, and energy-efficient transport policies and projects. ADB's actions to mitigate climate change from transport is guided by the Avoid-Shift-Improve approach: integrating land use developments with mobility needs to avoid the need for travel; providing a shift to energy-efficient modes of transport; and seeking to improve vehicle and fuel technologies. ADB's approach is unique in that it utilizes the Avoid-Shift-Improve framework directly, both as a planning and design tool, and incorporates all three dimensions holistically in its projects (as opposed to a more one-off approach). Using the Avoid-Shift-Improve model also helps ADB communicate sometimes-complex sustainability issues in a readily understandable way to its developing-member country partners. Using the Avoid-Shift-Improve approach, ADB has enabled the delivery of internationally recognized bus rapid transit systems that meet "gold standard" status. In conjunction with the BRT systems, ADB has also financed pedestrian and cycle way facilities, along with bicycle sharing systems, to ensure citizens can travel easily over the last kilometers to their destination and "avoid" traffic congestion. ADB also promotes incentives for a "shift" approach by including parking management techniques that encourage people to move out of cars and motorcycles and into more sustainable options. Finally, in all of these projects, ADB is working to "Improve" environmental quality with alternative, clean vehicle technologies such as clean diesel, natural gas, and even exploring electric BRT vehicles. In Lanzhou, in the PRC, municipal planners developed a sustainable urban transport system with a BRT component as its centerpiece. The project is ADB's first BRT project in the PRC (See: ADB's Assistance for Lanzhou's Sustainable Urban Transport Project). Nine months after its introduction in 2012, Lanzhou had been able to reduce carbon dioxide emissions by an estimated 11,804 tons, thereby avoiding greenhouse gas emissions equivalent to 2,262 passenger vehicles driven for a year (How to calculate greenhouse gas emissions equivalents). 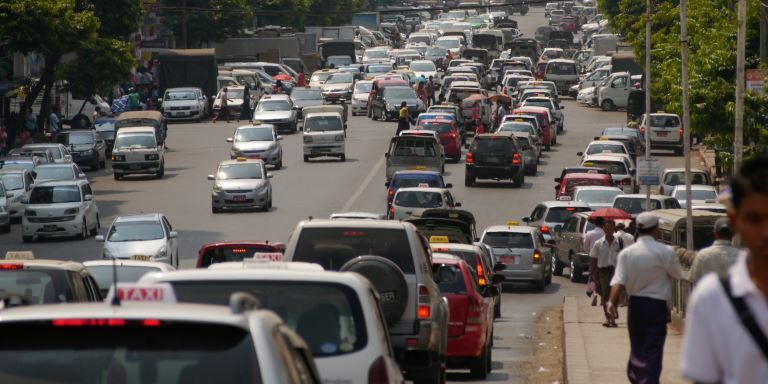 In Vientiane, the fast-growing capital of the Lao People’s Democratic Republic, the number of registered private vehicles grew by more than 10% a year for the past decade and a half. This surge in traffic resulted in an increasing number of accidents and worsening air quality. Drawing on the successful models and lessons of other state-of-the-art sustainable urban transport systems it supported, ADB extended a $35 million loan to help finance Vientiane’s BRT system and other transport innovations to help city dwellers avoid trips and to shift traffic flows. The BRT will have over 11 km of dedicated bus corridor lanes, 24 enclosed stations, and over 90 new low-carbon emitting buses. The project will also fund traffic management improvements in the heart of the city, including new signal lights at key intersections and a central control center. New electronic paid parking and national vehicle registration systems will be established, and pedestrian crossings and pavement upgrades carried out to improve the city’s walkability (see: ADB’s Assistance for Vientiane’s Sustainable Urban Transport Project). A rapid increase in vehicular traffic volume in the PRC created a new threat in the form of vehicle and vessel emissions. To stem the growing emissions, an ADB-supported project will build compressed natural gas and liquefied natural gas refueling stations along long-distance land transport corridors and inland waterway transport networks that cross municipal and provincial boundaries in the PRC. In addition to improving the availability of natural gas as a transport fuel in the country, the project is also expected to enable the PRC to avoid GHG emissions starting 2020 of about 2 million tons per year, equivalent to the emissions from 383,256 passenger vehicles driven for a year (see: Case Study on the Natural Gas for Multimodal Transport in the PRC). In addition, ADB also extends technical assistance (TA) support to its developing member countries through its "Unlocking Innovation for Development" Project, a crowdsourcing mechanism to identify, replicate, and scale up pilot initiatives that demonstrate innovative solutions to development challenges. The TA will also assist regional departments explore new business opportunities and scale up urban transport lending. The International Energy Agency has documented other examples of the successful implementation of the ASI model.